Died: 2/27/2012, Los Angeles, California, U.S.A.
A day late and a dollar short...I only found out about her passing this morning. My sincere condolences to her family. 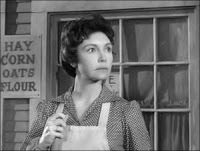 Of all the characters on the Rifleman, hers was the most genuine. Her true nature shown through, and brightly.